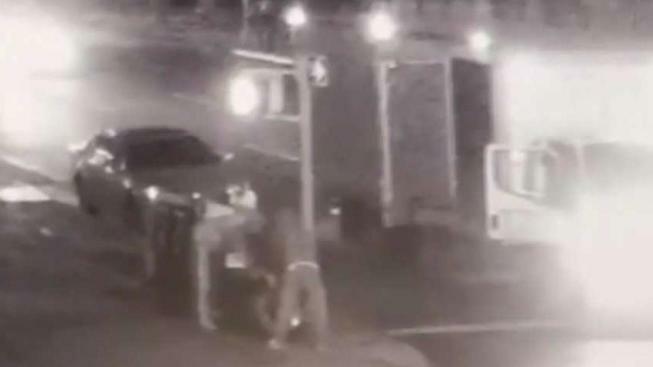 It's not clear why, but thieves are stealing the city's 275-pound trash cans. Melissa Russo reports in an I-Team exclusive. The latest theft spree in New York City is proving that crime can truly be a dirty business. The I-Team has learned that, for reasons that still aren’t entirely clear, thieves have swiped at least 20 trash bins installed by business improvement districts, charities and other organizations around Manhattan since Feb. 13. The bizarre caper has garnered the attention of the NYPD’s grand larceny division, which is looking for both the people responsible and a motive in the case. The cans, which are not the rodent-resistant and solar-powered bins that have begun to pop up around the city in recent years, retail for about $1,000 apiece, weigh 275 pounds and have been stolen from corners on the Upper West Side, Upper East Side, Flatiron District and midtown, according to the NYPD. Surveillance footage from one of the thefts, near Lincoln Square, shows two men struggling to steal the heavy can -- trash still inside -- and load it into the back of an unmarked box truck. It's not clear why the thieves are stealing the bins. They could also be selling them for scrap -- but scrap metal experts said they'd probably have to destroy them first, because most resellers wouldn’t accept something as obviously stolen as a New York City trash can out of risk of losing their licenses. And even if they did manage to sell them, the thieves would only net about $22 per can. The thefts garnered incredulity from New Yorkers who are stumped by the reasoning behind the crimes. “I can’t imagine why anyone would want a filthy dirty garbage can and what they would use it for?” one person asked. Still, the thefts are having real-world consequences. The Doe Fund, which employs homeless people to sweep the streets, said its workers have had to walk further to find places to dump the litter they’ve cleaned up. George McDonald, the fund's founder, added that some of the cans installed by the fund have been among those stolen. Anyone with information about the thefts should call Crime Stoppers at 1-800-577-TIPS.